While I currently don't have a dog I dog sit for friends and others through-out the year. Before kids my fur babies were my life. They were my first kids and my friends used to tell me they wanted to come back as one of my pets in their next life because of how deeply I loved my pets. I find this will most pet lovers. They are your babies! And if you are an animal lover, have a pet and take time for them you know that you eventually learn "pet speak". They understand you and you totally understand them. It is a love that is as deep as any other relationship with anyone else so sometimes you want to show them how much you love them with treats. Now this is where Milk-Bone comes in! With Valentine's Day approaching you may be tempted to give your furry friend a gift of love as you would with anyone who is important in your life but any good pet owner knows you cannot give them chocolate! It is not safe for dogs! 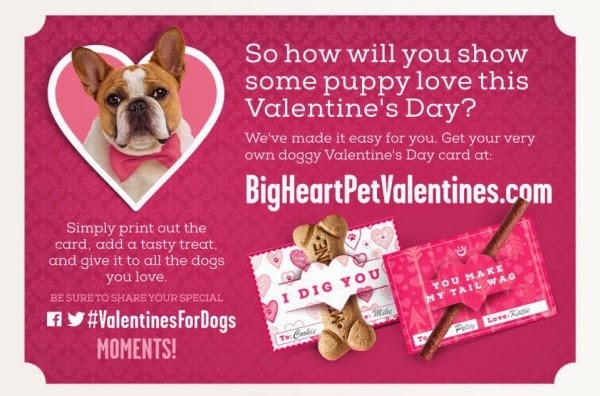 Maybe you want to give them a brand new squeaky or plush toy, take them out for a special walk at their favorite dog park, buy them a fluffy and comfy pet bed but if you really want to see a dog smile, you give them treats like Milk-Bone, Pup-Peroni, Milo’s Kitchen, but what is Valentine's Day without a card! Right?! WELL....get ready friends because you can print out your very own Valentine's Day Cards for Dogs. The cards are so cute! Print them, attach to a treat, take a photo, hang it on your fridg, make it your screen saver or if you have a furry grand-baby, furry niece or nephew you can send a card! To Enter Fill Out As Many Entries As You Like. The more entries, the better your chance and there is a way to come back and enter for entries every day. I learned that 39% of unmarried women would rather spend Valentine's Day with their dog than a romantic partner. I learned that I'm not the only one to say "I LOVE YOU" to my dog; 86% of people do this too! A perfect Valentine's day with my dogs would be sitting in my cozy bed with my dogs snuggling as they chewed on Milkbones! My home state of Florida is the #5 dog loving state! I learned that people in California are the most openly loving of their furbabies. All states should be up there with them. Well, I have five Treeing Walker Coonhounds and three cats (all rescues). My idea of an ideal valentines Day with them would include great weather, since I would love to take the dogs for a long walk/hike before stopping at PetSmart to get special treats for them (and tee cats). Once home, we would just snuggle and play and I'd give them both the store bought treats and the ones I made for them myself. It would be an all-day experience. I learned that 86% of people in the infogram tell their pet I Love You at least once a month. I learned that the State of California loves their dogs the most and that 86% of people tell their dogs that they love them. I could not see it! I am sorry! I learned that I need glasses! I love all the ways that dogs enhance our lives. They make them so much more enjoyable! I like the high percentage of people who say their dog comforts them. Oh I loved that 39% of unmarried women would prefer a doggy date on Valentines!!! My state is number three on the list for love of their dogs! Yep, we love our dog! I learned that three of the four states in which I have lived are represented in the Top Ten most dog-loving states! Yay! I learned 73% of people buy their dog a gift once a month, glad to know I'm not the only one! Oh perfect Valentines for me and my dog would be a long walk, curling up on the couch for tummy rubs...and a new toy and bone! Ours was not that great today with her little dog. We had to move my daughter out of her apartment today all day. The dog was super tired and so were we! Hi! I learned that the state I live in, Florida, is #5 in the state's who love dogs list. I'm a proud boxer owner that thinks this fact is oh so true! My perfect Valentine's Day with my boxer boy Neo includes a nice walk, snuggling on the couch, and sharing peanut butter snacks. So perfect!! I learned that my state is #9 in dog lovers and that 66% of women find dog owners more attractive. Our dog Chance would love a walk through the woods, a raw hide treat and to curl up with the kids to watch a movie. Valentines day my dogs day out would be to go to Lucky Dog restaurant out on the patio bring their favorite treats Milk Bones of course and hang out with friends and their dogs too. Well, I can barely read tyhat infographic, it's so tiny, but apparently we dog owners make the best romantic partners! Mike and I (that's my dog) spent Valentines together. He sleeps on the floor in my room (won't sleep in his bed or mine) then has an excited run around with his ball. We went for a walk. He's a senior dog, so he gets tired. So he slept some more. I would describe the perfect valentine day with a pet as going to the dark park, followed by treats, followed by cuddling on the couch. I learned that California is the top dog loving state. My perfect Valentine's Day with my dogs would be a nice hike to start the day off, a trip to the pet store for new toys and treats, some extra lap and play time followed by a home cooked meal. I like the Top 5 most popular ways to have a dog-loving Valentine’s Day. I’ll have to try them with our dogs. The perfect Valentine's Day with our dogs would be a warm catered day at the ocean with lots of romantic treats for the four of us.